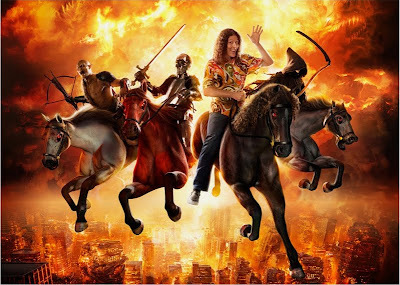 Home » alpocalypse , comedy , humor , merchandise , music , weird al yankovic , you know you wanna » ALPOCALYPSE... WOW! We are now just over three weeks away from the Alpocalypse!!! So many people tried to access "Weird Al" Yankovic's online store yesterday that they crashed the server! Most people will probably go for the CD/DVD set, which includes the standard music disc and a DVD containing music videos for ten of the songs. The Deluxe Package includes all that plus a limited edition 18"x24" gallery quality Alpocalypse album art lithograph. And the Super Deluxe Package? It has the CD, the DVD, AND a limited edition SIGNED AND NUMBERED cover art lithograph, and also a "highly limited run 4'x4' Alpocalypse Wall Mural made by Fathead". Yowza!! C'mon, spring for the Super Deluxe Package. You know that you're lusting for it badly! And it'll be your chance to clear your conscience for all those Weird Al songs that you've been downloading for years without paying for them, you hooligan!! Here's the track listing for Alpocalypse! 7. "Party In The CIA"
10. "If That Isn't Love"
12. "Stop Forwarding That Crap To Me"